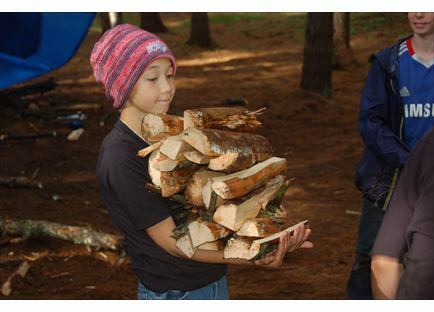 Pine Island's woodcraft program teaches boys the basic camping skills they'll need on our many trips. Boys can learn basic axemanship, fire building, first aid, emergency shelter construction, leave-no-trace techniques and much more. Achievement in woodcraft at Pine Island culminates in the Maine Woodsman and Junior Maine Woodsman certification program, which includes in-camp instruction, followed by a supervised 3-day trip where campers construct their own sleeping shelters, cook all the food themselves, and pass numerous examinations in essential camping skills.